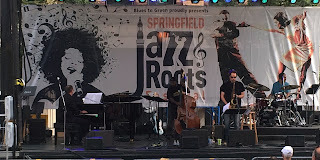 This weekend I had the great opportunity to go to the Springfield Jazz Festival. Blues to Green Inc. made this free festival possible so that people of many different communities could unite in the urban center of Western Massachusetts to share their love for music and art, thus spreading a more positive image of the greater Springfield area. 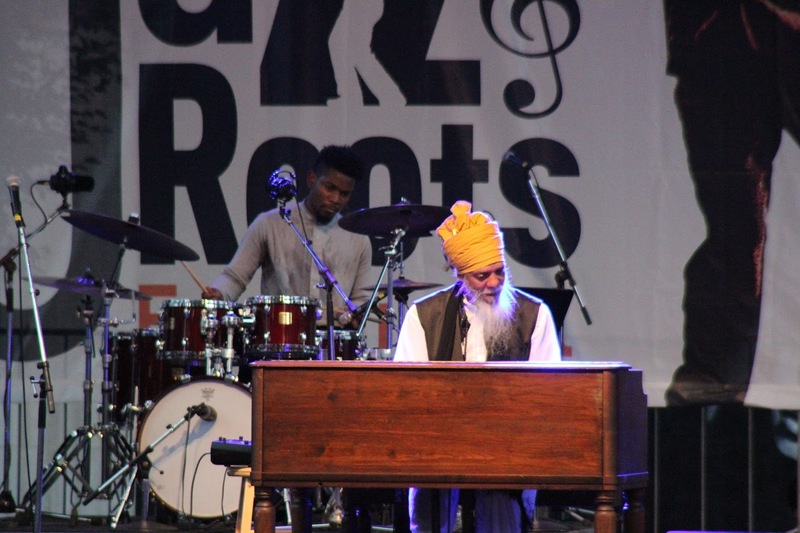 I had the good fortune to see the Jeff Holmes Quartet with Dawning Holmes, Elan Trotman, Avery Sharpe and the New England Gospel Choir with Angel Rose & Charles Neville and Big Chief Donald Harrison with special guest Dr. Lonnie Smith. 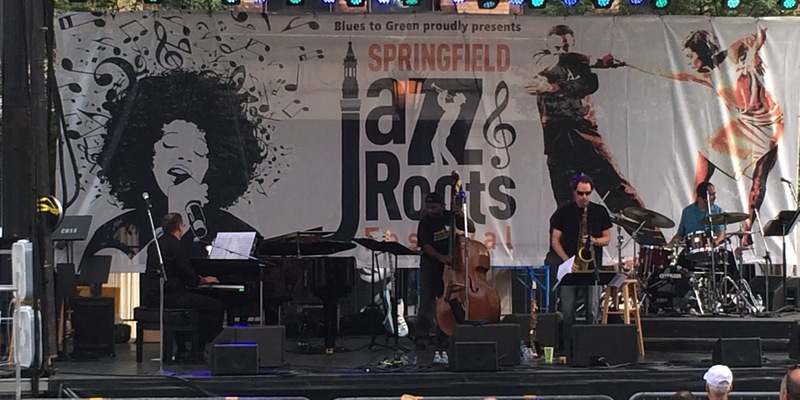 The Springfield Jazz Festival, much like the Cambridge Jazz Festival I recently attended, was truly family friendly. 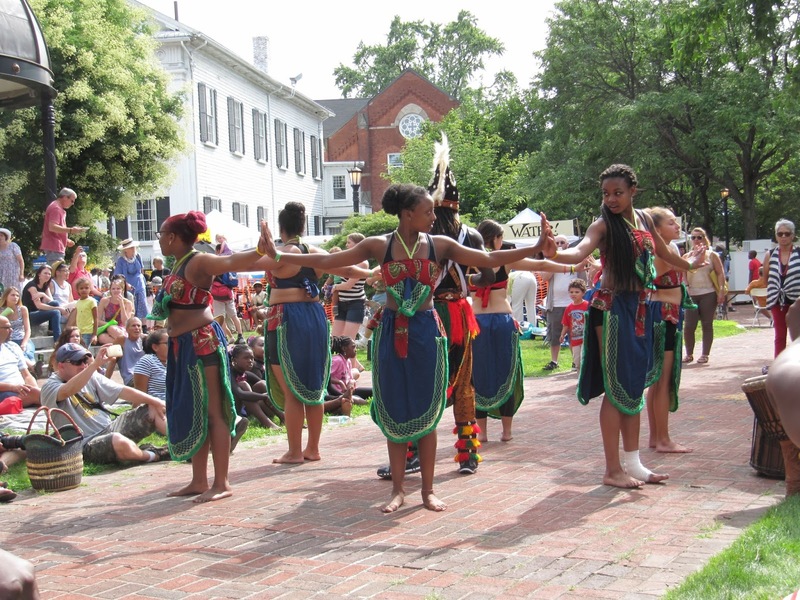 With an art tent, plenty of food vendors, festival merchandise and other community businesses, you could listen to the music while walking around the beautiful downtown area. There was a main stage, as well as a community stage in a neighboring church, highlighting local talent as well as national acts. The first act I caught was the Jeff Holmes Quartet with Dawning Holmes. Jeff Holmes is a professor of music and the director of jazz and African-American music studies at UMass Amherst. Blending original music with a classic setup, Holmes' band reminded me a bit of saxophonist Michael Brecker's groups. 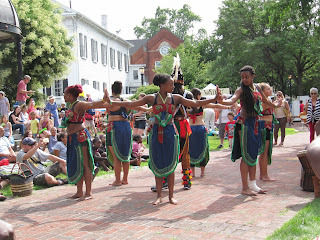 In-between the musical acts there were performances by the Movement Project and Wofa African Drum and Dance ensemble in Springfield's Court Square. The Movement Project is a nonprofit that helps local kids dance, play instruments, take fitness classes and perform to led happier, healthier lives. It is always nice to see the intersection between music and dance, and how they truly go together. 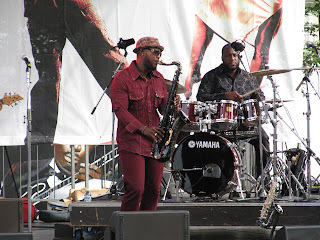 Afterwards, saxophonist Elan Trotman melded music from his native Barbados with jazz. 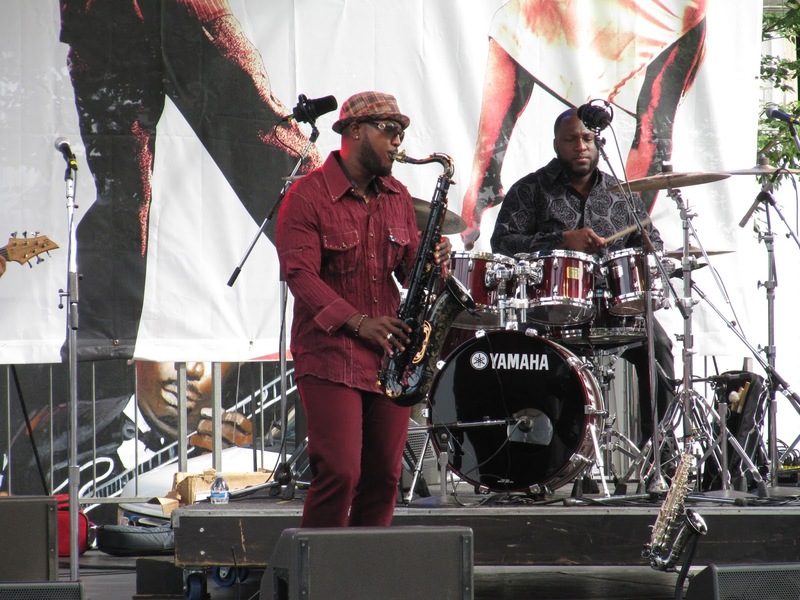 Trotman exhibited a variety of influences, playing everything from original music to Ed Sheeran's "We Found Love" and Sonny Rollins' "Don't Stop the Carnival". Trotman's blend of Barbados music with jazz and pop created an array of catchy, danceable songs. Trotman's full, warm tone blended with the steel drums in his band to take the audience to the islands. Showcasing the Barbados sound, Trotman's original, "Funkalypso" blended funk and calypso music. 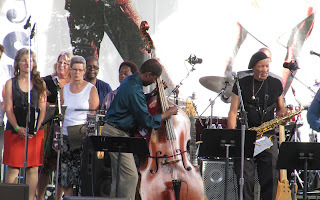 Bassist Avery Sharpe has played with countless jazz legends, from Wynton Marsalis to Pat Metheny and McCoy Tyner. What's even more exciting is that Sharpe grew up in Springfield, MA. Before his group played, the mayor honored him by declaring August 8th Avery Sharpe day in the city of Springfield. This honor was touching to witness, and surely inspired countless people in the audience to see a homegrown legend. 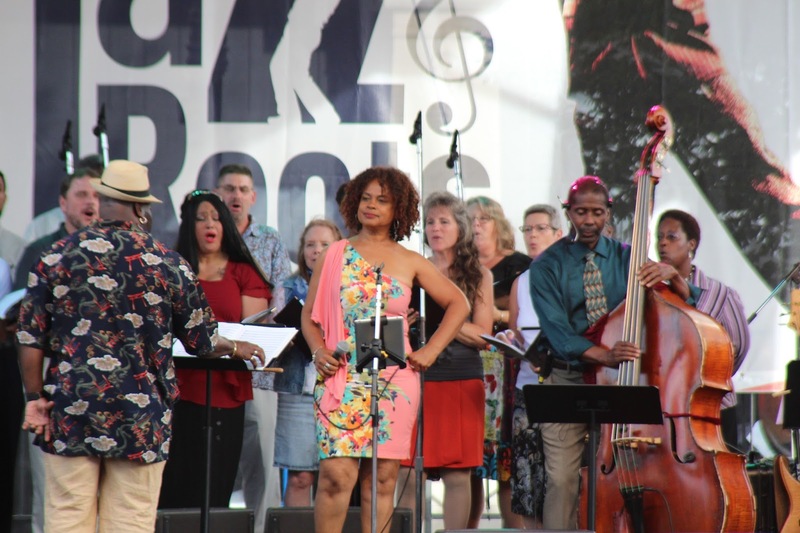 For his set, Sharpe was joined by the New England Gospel Choir, vocalist Angel Rose and saxophonist Charles Neville to share his most recent project, "Sharpe meets Tharpe", a salute to gospel singer, Rosetta Tharpe. A standout of his set, Sharpe rearranged "Down By The Riverside" from a major key to a minor key, lending a solemn nature to the spiritual. Rose stunned the audience with a passionate rendition of Tharpe's "Up Above My Head" with call and response between the choir. 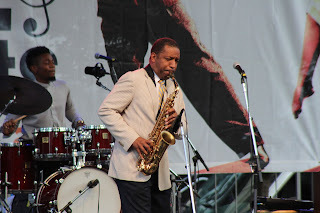 Big Chief Donald Harrison is a jazz saxophonist, singer, actor, teacher and mentor that developed "nouveau swing", a combination of "Afro-New Orleans" style, R&B, hip hop, soul, rock and jazz. This 'catch all' term, however, didn't describe the sheer energy, power and fun Harrison brought to the stage, spontaneously bursting into a rendition of James Brown's "Get On Up". 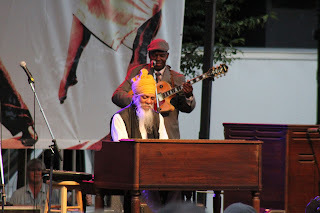 Organist, Dr. Lonnie Smith, joined Harrison after a couple songs, kicking it off with the standard "I've Never Been In Love Before". 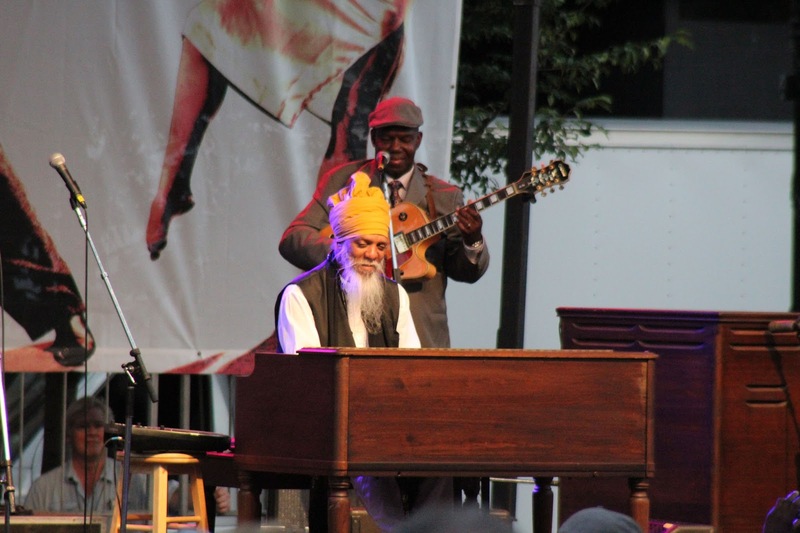 Smith is a Hammond-B3 legend, having played 'soul jazz' with George Benson and Lou Donaldson among others. An accordionist even joined the group for a couple of songs, bringing an entirely new sound to the music, surprisingly blending well with the timbre of the organ. Harrison and Smith interacted with the audience by getting everyone to dance regardless of who they were or where they were from. Springfield was on its feet dancing the evening away! What was so beautiful about the Springfield Jazz Festival was that the people were so friendly and welcoming. 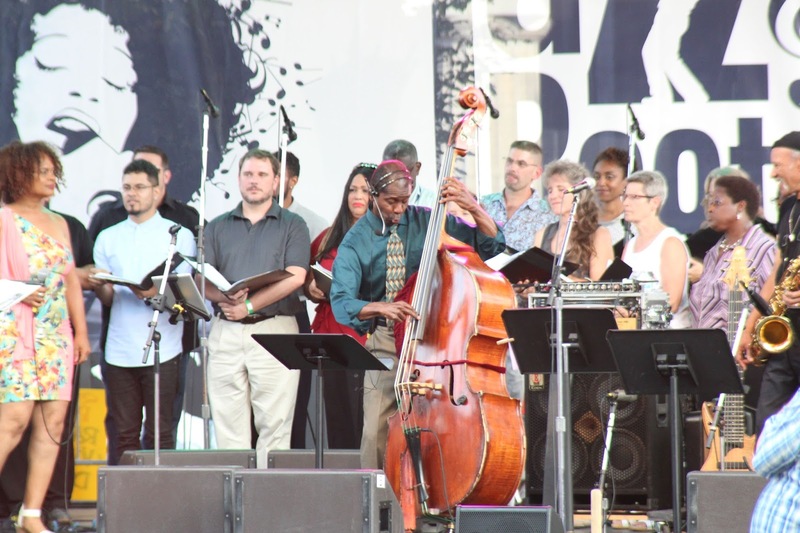 Springfield, and Massachusetts as a state, has a lot of music, jazz and beyond, with some very strong communities. Whether the crowd was dancing during Donald Harrison's rendition of "Get on up" or embracing old and new friends, the sense of unity was golden. Please visit my jazz poetry blog, "Without a Poem", where I improvise a new poem everyday! I also share jazz music and art there, so stay tuned! This week inspired my haiku, "Spinning Wheel".